Fortunately, Princess Mary was just about grown-up enough to play her part in reinventing the Royal family as being both loyal and British. Princess Mary’s Gift Book brought the seventeen-year-old Princess right into public view and her portrait was painted for the frontispiece, by J. J. Shannon, R.A. one of the leading portrait painters in London. Shannon was a founder member of the Royal Societies of Portrait Painters and, in 1897, elected an associate of the Royal Academy, and R.A. in 1909 – a thoroughly respectable member of the British establishment. 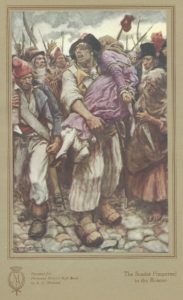 Note how he depicts the Princess as modest, simply dressed – she wears no jewellery – and unpretentious, no over-formal foreign clothes for her! 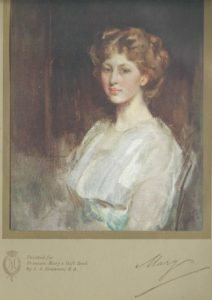 The Princess, under the aegis of her formidable mother, Queen Mary, wrote a personal introduction to Princess Mary’s Gift Book: all profits from the sale of the book would go to Queen Mary’s ‘Work for Women Fund’ which was set up to assist working women who found themselves in financial difficulties because of the war. For example, women working in the textile and clothing industries lost their jobs after their export markets closed. Queen Mary brought their case to the War Emergency Workers’ National Committee, which resulted in contracts for women textile workers to supply clothing and other items for the Army Supply Department. 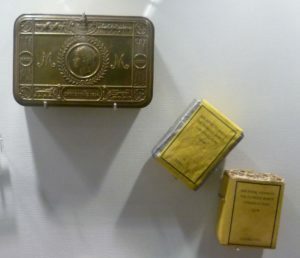 Princess Mary’s 1914 Christmas Gift comprised a packet of cigarettes, a packet of tobacco and a specially commissioned cigarette box. The one above is in the Household Cavalry Museum. 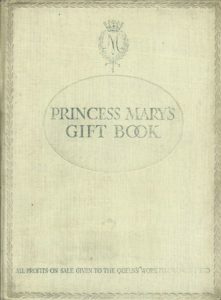 The sale of Princess Mary’s Gift Book raised over £100,000, enough to send the Christmas 1914 gift, pictured above, to every British soldier and sailor. The message was clear: the royal family was 100% on the British side. And, on July 17th, 1917, King George declared by Royal proclamation, that ‘Our House and Family shall be styled and known as the House and Family of Windsor’. So what was in the Gift Book? It contained twenty stories or poems by well-known authors of the time; illustrated by fourteen paintings, photographed in full colour, and numerous black and white drawings, again by well-known artists. 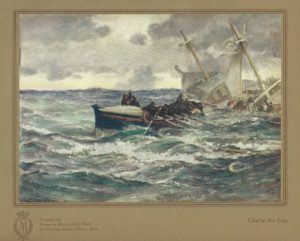 For example, there is a short story by H. Rider Haggard, author of She and King Solomon’s Mines, in which explorer Allan Quartermain tells his old friends, Sir Henry Curtis and Captain Good, the heroic story of how the Zulu runner, Magepa the Buck, saved his baby grandson’s life at the cost of his own. 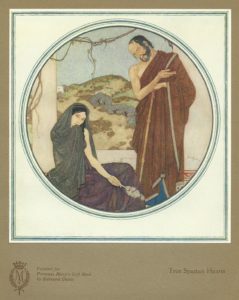 The black and white drawings are by J Byam Shaw, artist and illustrator, who later founded the Byam Shaw School of Art. Baroness Orczy, author of The Scarlet Pimpernel, contributed Out of the Jaws of Death: A Pimpernel Story, in which the intrepid hero, Sir Percy Blakeney, and five aristocratic English friends disguised as bloodthirsty French Revolutionaries, rescue an innocent French family from Madame Guillotine. The artist, A. C. Michael (1881-1965), was a popular painter and illustrator who worked for The Illustrated London News and The Strand Magazine, and did illustrations for such authors as H. G., Wells, and H. Rider Haggard. The story’s black and white illustrations were by C. E. Brock, who many of us will know from his classy illustrations for Jane Austen’s novels. 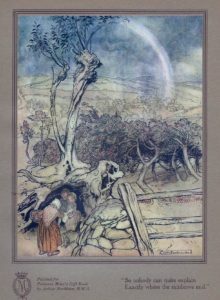 ‘So nobody can quite explain/ Exactly where the rainbows end’, illustration by Arthur Rackham (1867-1939) for Lady Sybil Grant’s poem, ‘Land of Let’spretend’. Lady Sybil Grant (1879-1965), daughter of the 5th Earl of Rosebery, had had several stories published in the London Magazine when she was invited to contribute her whimsical poem, The Land of Let’spretend to Princess Mary’s Gift Book. I can’t say I rate the poem very highly; however, Arthur Rackham no less contributed a specially painted watercolour and a number of line drawings in his usual Gothick style to illustrate it. According to Wikipedia, in later life Lady Sybil Grant became an eccentric, spending much of her time in a caravan or up a tree, communicating with her butler through a megaphone. The playwright J. M. Barrie, author of Peter Pan, contributed, as did the Bishop of London in the transcript of a short talk designed to encourage young men to join up: I would rather die than see England a German Province, he ended, to rousing cheers. Arthur Conan Doyle contributed Bimbashi Joyce, featuring a naïve, newly-commissioned officer, struggling to deal with a difficult incident on the Egyptian-Libyan border. The story has a neat twist in the tail. 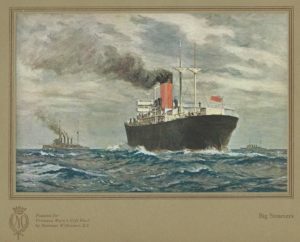 ‘Big Steamers’ specially painted for Princess Mary’s Gift Book by Norman Wilkinson R.I.
Rudyard Kipling (1865-1936), contributed his popular poem, Big Steamers, splendidly illustrated by Norman Wilkinson. Kipling was probably the best known popular novelist and poet of the age. Everyone knew his Jungle Books, Puck of Pook’s Hill, Plain Tales from the Hills and his masterpiece, Kim. Not to mention his poetry. Even today, If is regularly voted Britain’s best loved poem. In 1922, Princess Mary, later the Princess Royal, married the 6th Earl of Harewood. Throughout her life, she supported a number of charities, particularly to do with nursing (she herself had trained as a nurse during World War I) and the new Girl Guide movement. She became, like her mother, a formidable woman who chose her charities carefully and got a lot done. My copy of Princess Mary’s Gift Book once belonged to my Great Great-Aunt Ida and is dated December 12th, 1914. I found it in an attic when I was a child and I’m delighted to have it. I wish you all a very Happy Christmas. I shall be back on the first Sunday in January. Oh, what a wonderful thing! The idea, the book itself and the very clever PR. I have much enjoyed your posts this year. All the best for the festive season and beyond. Thank you, Jan, for your lovely compliment. I’m delighted that my posts have given you pleasure. I felt sorry for Princess Mary, being the only girl in the family and, as a mere female, not having the opportunities her brothers had. The Princess Mary Gift Book experience gave her a chance to spread her wings and, from what I can gather, she obviously grabbed it. Wow, so interesting, Elizabeth. Love the lady who spent her time up a tree with a megaphone! And Edmund Dulac is a favourite illustrator of mine. I have one of the Folio fairy tales with his wonderful illustrations. It’s a lovely tale and shows how the Royals of the time, as in our time, were very much into helping others less fortunate than themselves. The Government also realized that soldiers would be reluctant to fight if their womenfolk were left with no money coming in. The war also had the unexpected result of vastly expanding work opportunities for women who found themselves doing men’s jobs perfectly competently. Queen Mary’s ‘Work for Women Fund’ rapidly became a vital part of keeping the country going – rather than being something which just gave the soldiers some creature comforts which, perhaps, is what the Queen had envisaged at first.